Sometimes, the market delivers an exceptionally big bar with a wildly out-of-whack high or low, called a spike. A spike is a bar that encompasses a much wider high-low range than the bars immediately preceding it. Do spikes matter? Yes, although sometimes they’re just randomly generated by rumors and market silliness. In some cases, a spike turns out to be an anomaly. This figure shows such a case. The spike low suggests that some people panicked and were selling so much and at such a frantic pace that buyers got a bargain at abnormally low prices. But panic was misplaced. The next day, the price resumed its uptrend and its same “normal” high-low range. The spike was just an oddity — a random move. Maybe the panicked sellers believed a rumor that the buyers didn’t hear or knew was false. Or perhaps the sellers were deliberately trying to break a support line. This figure is, in contrast, an important bar named a key reversal because on the next few days, the price proceeded to make lower highs and lower lows — this bar marks a trend reversal. 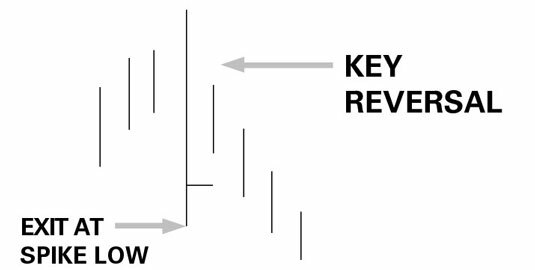 Key reversals can be ordinary bars and aren’t always spikes, but when you see a spike, always ask yourself whether it qualifies as a reversal. You seldom know whether a spike is random or meaningful on the day that it happens. Only hindsight can tell you that. Investigate the environment. Sometimes you do know when a spike is a key reversal because you can determine what shock caused it and use your judgment in interpreting that the news or event is sound. Continuation spike: In the first chart showing a spike low, the close is near the high. The wider high-low range and the lower low are a worry, to be sure, but the position of the close near the high trumps those worries. Key reversal day: The second chart shows three components to worry about — not only the wide high-low range, but also the lower low and close near the low. A conservative trading tactic is to order your broker to sell the security if the price falls below the low of the spike day over the next two or three days. This method is plain old crowd following. Everybody can see the same spike low and many will have sell orders at that level, and you should, too.